Action from the Thurlby 10k. Werrington Joggers were out in force at the popular Thurlby 10k at the weekend. With the race forming part of their club championship, they made up nearly a quarter of the 200-strong field. The race win went to Bourne Town Harrier Jonathan Palmer, with a 35:10 clocking. 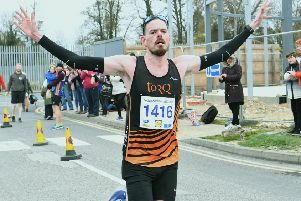 Jeff Lucas was the first ‘Jogger’ home, taking seccond place in 37:29, with Scott Lloyd finishing fifth and Jack Green eighth. Nene Valley’s Olly Slater came home sixth. Werrington veteran Ann Wood was the ladies winner in 44:52.